HKEX is joining the World Economic Forum in Davos, Switzerland for the first time. Our delegation, which includes HKEX Chairman, Laura M Cha and Chief Executive, Charles Li, will be busy throughout the week long forum listening and talking with global leaders, promoting the city and its financial markets and sharing Hong Kong's story and the opportunities available in Asia’s world city. We will be publishing a live blog throughout the duration of the forum, from 21 January to 25 January, so readers can keep track of some of the exciting discussions and key takeaways from the event. Check back frequently and follow us on Twitter and Weibo for updates. It has been a day of media interviews, panel appearances and fascinating dialogue for the HKEX team in Davos. Chief Executive Charles Li appeared on CNBC to talk about Hong Kong's vibrant financial markets while Chairman Laura M Cha spoke with CNN on why HKEX is the world's premier IPO market again this year. Li also joined an impressive panel of speakers discussing global financial governance. The panel passionately debated the role central banks and markets play in protecting against financial instability. All this followed HKEX's breakfast, and was before Hong Kong night - an evening of celebrating all things Hong Kong. HKEX partnered with the HK government to host the dinner, with HKSAR Chief Executive Carrie Lam and Laura Cha welcoming friends from around the world. Klaus Schwab, the founder of the World Economic Forum, also joined the dinner and welcomed the first ever broad Hong Kong contingent to Davos. It was a long - but super productive - day, and a fantastic opportunity to talk about Hong Kong's bright opportunities in world markets and the global economy. 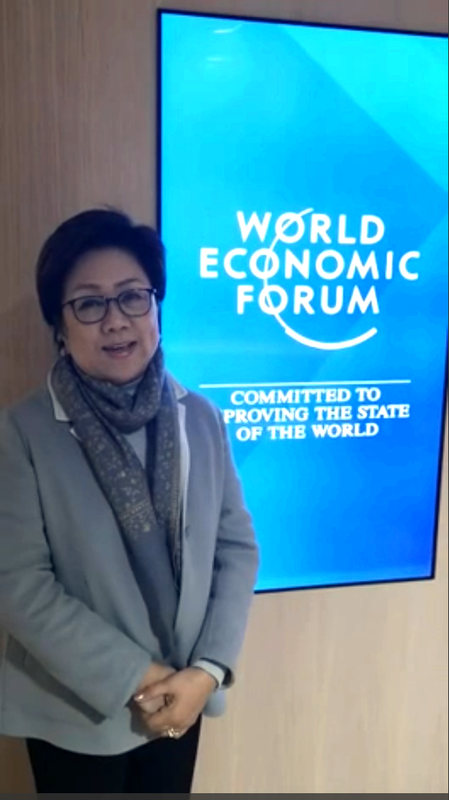 Day four got an early start in Davos, with HKEX hosting a breakfast with the Chief Executive of the Hong Kong Special Administrative Region Carrie Lam. HKEX Chairman Laura M Cha and Chief Executive Charles Li also welcomed the Chairman of Bloomberg Peter Grauer and the Deputy Vice Chair of the CSRC Fang Xinghai. The carbon footprint from our trip to Davos has been offset with a little help from our friends at Refinitiv! The healthcare industry is ripe for innovative solutions that help to integrate emerging technologies, enhance efficiency and lower costs for patients. One potential solution is data. There is a growing consensus that data will be a huge driver of the healthcare sector globally, particularly in terms of how it’s shared. That was the core of a luncheon in Davos today called “Igniting Innovation Through Healthcare Data” that included healthcare professionals, providers, insurers and investors. Participants in the discussion agreed that sharing healthcare information on a global basis will transform the healthcare industry, facilitating the development of new medications and service models. But concerns over data privacy, particularly in light of recent high-level data leaks, will be a tough sell for consumers. Protecting that data while finding a standardised way of pricing and trading it is a challenge — but also an opportunity. We were all split into breakout groups to figure out a path forward. I ended up taking over the discussion at my table by proposing exchanges as a central repository of healthcare data to alleviate privacy concerns. It would include a facility for owners of data to be remunerated for sharing their information via a trusted central counterparty on the condition the data is encrypted and anonymous. I believe that HKEX, as a trusted builder and operator of critical infrastructure with potential access to a vast quantity of data in China, could play a major role in this area. These are fundamental problems that affect all of us, and it’s exciting and inspiring to debate various creative solutions with some of the world’s brightest minds. Day three here in Davos dawned with Chairman Laura Cha and I attending a very insightful breakfast hosted by HSBC. Blackrock CEO Larry Fink, Moller-Maersk CEO Soren Skou, and HSBC Chairman Mark Tucker talked about global trade and the changing world order. Focus areas included AI and robotics and their impact on trade and supply chain management, the continuing evolution and influence of China, the impact of 5G on consumer preferences and the importance of corporate purpose and sustainability. Fink also said there is strong evidence that those companies that invest in ESG are better businesses. The session was a great start to the day, which is again filled with engagements. I did hear a great quote this morning, one that’s stuck with me: “What happens when you apply AI to a stupid process? You just make your stupid process artificially intelligent.” Thanks to Benoit Claveranne, the CEO of International and New Markets at AXA, for keeping everyone grounded amid all the excitement over AI! Today I had the privilege of attending an insightful discussion on global financial risk with some excellent panelists, including CSRC Vice Chairman Fang Xinghai, Jin Keyu of the London School of Economics, Bridgewater Founder Ray Dalio, and UBS Chairman Axel Weber. It was moderated by Maria Bartiromo of Fox Business Network. Vice Chairman Fang kicked off the discussion by acknowledging that China’s economic growth is slowing and a rebalancing is needed, while also noting that China’s annual six per cent GDP growth rate still gives the government room to borrow to support the economy in the short term. That led into a broader discussion on central bank and fiscal policy. Ray Dalio said he believes the global debt cycle is in the “7th or 8th inning”, and that the Fed is probably tightening too quickly. Bond Connect and Stock Connect got a great mention from Axel Weber, who said that the connections between markets and the opening up of China’s economy to international competition are important drivers of growth. Jin Keyu stood out for her comments on China’s need to reform its economy and how current geopolitical pressures are actually helping accelerate that process. She gave China some credit for recent successes in the past couple of years in rebalancing its economy. HKEX is proud to be part of a much larger Hong Kong delegation at Davos this year, which helps to amplify our message about opportunities in Hong Kong, what makes us unique and why we have such a bright future. We met up with the others in the Hong Kong family on day two, including the Hong Kong SAR’s Chief Executive Carrie Lam. The theme at this year’s forum is Globalisation 4.0, and finding ways to combat some of the world’s most pressing problems such as climate change and rising global economic inequality. Hong Kong is a super efficient city with exceptional transportation, a sound legal system, vibrant international financial markets, and it continues to nurture a strong pool of professionals from around the world in our financial ecosystem. These are just some of the areas where Team Hong Kong agreed we could lead by example and contribute to Globalisation 4.0. Aside from the Hong Kong meetup, the HKEX team attended more than eight separate sessions on subjects as far reaching as artificial intelligence, global financial risks, and sustainability investing. We also took a number of media interviews on a range of topics, including with Bloomberg and the Economist. The sessions here have certainly been inspiring, and are important reminders of the value of working together to find resolutions domestically as well as internationally. We had the chance today to attend a session called Shaping a New Market Architecture, which had a very impressive and influential panel including Blackstone CEO Stephen Schwarzman, Indian Central Bank Governor Raghuram Rajan, and the Chairman of Sinochem Group Gaoning Ning, among others. They broadly agreed that digital capabilities make managing big companies easier to manage, and digital skills at school need to better reflect the world in which we’re living. Digital literacy is, the panel agreed, one key to eradicating inequality of wealth. The session was moderated by Too Big to Fail author Andrew Ross Sorkin. That was the opening line from Hendrik du Toit in a fascinating overview of the global asset management industry and sustainability metrics hosted by FTI Consulting at Davos this morning. The Joint Chief Executive Officer of Investec Group called for all corporations to have a Head of Sustainability on their boards, much in the same way as companies have a Head of Risk or Audit. He also cited the current lack of standardisation of environmental, social and governance (ESG) data as the biggest constraint on asset managers, and called for shareholder activism to evolve so a productive dialogue results. He was particularly insightful on multiculturalism, the need not to judge strong governance and ESG purely on western metrics, and for companies to be purpose-driven in what they do. It was a ‘big picture’ discussion here at Davos, with floor questions from journalists, fund managers and politicians – all before 8:30am! Chief Executive Charles Li and I took a walk this afternoon to chat about our upcoming Strategic Plan, and ended up going up the Jakobshorn Gondola to catch a view of the town of Davos from the mountain. It could be that the air is a bit thinner up here, but it's definitely a great place from which to get some perspective and think about new ideas. After that, we each headed off for separate engagements, and then to the opening evening cocktails. Looking forward to an early start tomorrow! I am pleased to report that the full HKEX delegation has arrived safely in a very chilly Davos. The weather has been quite a shock to the system, having left Hong Kong last night where it was 20 degrees. My phone is telling me it is currently minus 9 here in Davos! Still, it's beautiful and very very snowy, and we are all looking forward to the forum getting started this afternoon. We have time now for a quick cup of tea while studying our itinerary and map of Davos. Then we'll meet the team for lunch to talk about the many meetings, conversations, interviews and presentations that we will host and take part in over the coming days. We’re excited to get started! Spotting a spectacular sunrise on board the train from Zurich to Davos ahead of the opening of the World Economic Forum 2019. It’s been a busy start to 2019 for HKEX, with our colleagues picking up plenty of frequent flier miles! Earlier this month, a delegation from HKEX was in San Francisco for the JP Morgan Healthcare Conference, where we saw plenty of excitement over our new rules that welcome pre-revenue biotech companies. Then last week, we co-organised the China Bond Market International Conference in Beijing. Both our renewed Listing Rules and Bond Connect are off to a good start, and we expect them to continue building momentum in 2019. Now we’re off to Davos, Switzerland for one of the most important events on our calendar. Last September HKEX became a member of the World Economic Forum, which is the biggest platform in the world for the private sector, governments, NGOs and prominent thought leaders from a wide range of sectors to join forces and try to tackle some of the world’s most pressing challenges. The theme of this year’s Annual Meeting is Globalisation 4.0, with a particular emphasis on combatting climate change. It will also seek creative solutions for other areas affected by globalisation such as the food supply, human migration, labour, and of course, rising trade tensions. As an open, well-respected international market with an abundance of talented, multi-lingual professionals, Hong Kong has the potential to make important and meaningful contributions in a number of areas. Our city has a great story to tell, and plenty to be proud of. Charles Li and I will actively promote the benefits and opportunities of our financial markets, while Hong Kong SAR Chief Executive Carrie Lam will be talking about Hong Kong’s bright future on a more macro level. We will be part of a larger Hong Kong family sharing insight about our great City at this forum. It’s a fantastic chance for all of us to promote Hong Kong to a highly influential and diverse international audience. We plan to share some of our insights and our thoughts here over the next few days, time permitting. Our schedules are packed from dawn until late into the evening with speeches, panel discussions, networking functions, and group meals, the highlight of which will be a dinner hosted by Chief Executive Carrie Lam entitled “Think Global, Think Hong Kong” on 24 January. Back now to packing my snowboots and warm jackets! We look forward to updating you when we arrive in Davos.